Want a New BFF? Instead of a Best Friend Forever, become one of Debora’s Blessed Friends Forever! The Blessed Friends Forever Club is a special group of women who team up with Debora to help expand her ministry and assist with promoting her books. Members get to enjoy special perks! It’s FREE. All you have to do to become a member is sign up below. Reading chapters of Deb’s new books before everyone else. Access to special teaching from Deb created just for this group. Participation in exclusive conference calls and contests with Deb. 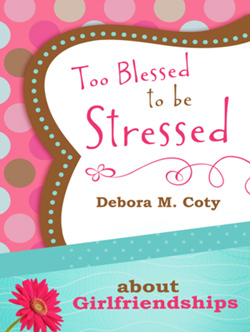 Get a FREE copy of Deb’s exclusive 23-page e-book, Too Blessed to be Stressed About Girlfriendships. Post book snippets on Facebook and Instagram. Recommend Deb to women’s ministry leaders.